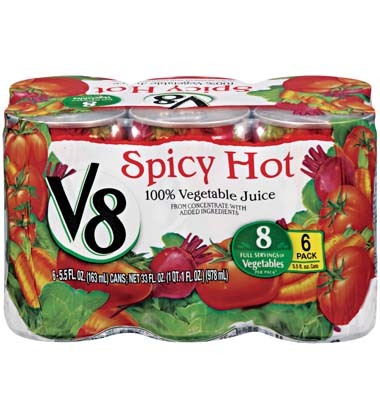 Spicy Hot V8 juice helps your patrons get 2 servings* of vegetables in every nutritious 8-ounce serving with a zesty kick taste buds will crave. 1. In a large sauce pot, heat olive oil. Sauté onions and celery until light brown. 2. Add rice, V8® Spicy Hot Vegetable Juice, water and salt. 3. Cook rice on low to medium heat until al dente. Fluff with a fork. Reserve and keep warm. garlic, peeled, slivered	 1 tbsp. black pepper, ground	 0 1/2 tsp. 1. In a medium sauce pot heat olive oil. Add garlic, V8® Spicy Hot Vegetable Juice and whole roasted tomatoes. 2. Add salt and pepper. Simmer for 30 minutes. Using blender, puree until smooth. Reserve and keep warm. 1. In medium sauté pan heat olive oil . Add grape tomatoes. Cook on high heat for 30 seconds. Reserve and keep warm. kosher salt	 0 1/4 tsp. black pepper, ground	 0 1/8 tsp. 1. In a large sauté pan, heat olive oil. Sauté spinach until wilted. Season with salt and pepper. Reserve and keep warm. 1. In a large sauté pan, heat olive oil. Sauté shrimp for 2 minutes. Add second measure of garlic until lightly brown. 2. Add lime juice and cilantro. Reserve. 1. Mix 1/2 cup of tomato sauce with rice mixture. 2. Using a #4 scoop, portion 1 cup rice onto center of plate. 3. Top with a #16 scoop, 1/4 cup spinach. 4. Using tongs, place 5 shrimp around rice. 5. Using a 2 oz. 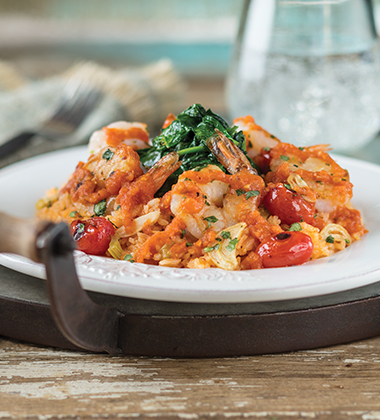 ladle, drizzle 1/4 cup tomato sauce around shrimp. Garnish with about 1/8 cup. blistered tomatoes. Serve immediately. black pepper	 0 1/2 tsp. black pepper	 0 1/8 tsp.